With three months to go until its release, it’s time to start getting really excited about Dawn of the Planet of the Apes. It’s been perhaps overshadowed in the blockbuster stakes this year in terms of hype, with superhero films dominating coverage, Godzilla being hyped up beyond belief, and Transformers and Interstellar around the corner. 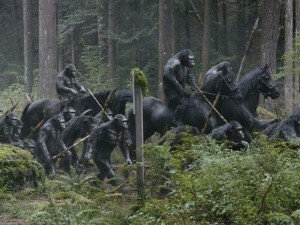 New images released yesterday give us a lot more information about the state of things in this follow up to 2011’s Rise of the Planet of the Apes. Rise was a brilliant origins film, breathing life into the hit-or-miss franchise, whilst getting a new generation of people excited about it. The end of the last film left the apes loose following an excellent escape and battle on the Golden Gate Bridge, whilst a virus had been unleashed on humans that would wipe many of them out. Fast-forward a decade and we can see just how far the balance of power has changed. 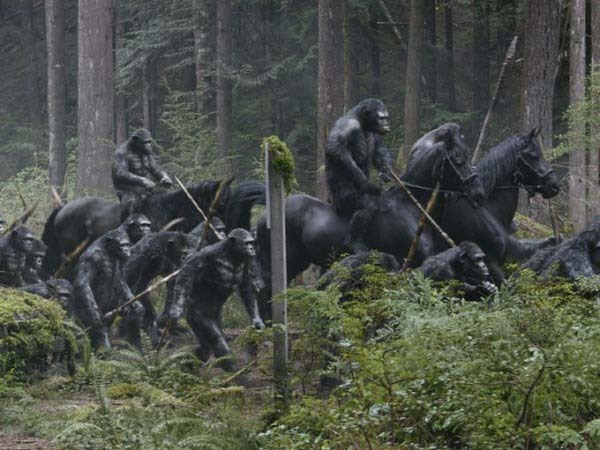 The apes were just about formulating words at the end of Rise, but we have a glimpse of a lot more progression from these images – they’re using shotguns and riding horses! This alone should make the film worth seeing. Being set a while after the last film, and with the storyline becoming a lot grander, it makes sense that we aren’t catching up any longer with James Franco and Freida Pinto’s characters. 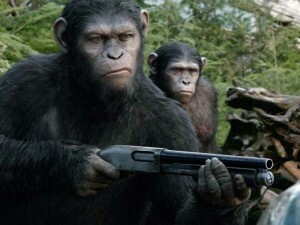 Caesar and the apes come under threat from a group of human survivors, leaving the world on the brink of war. 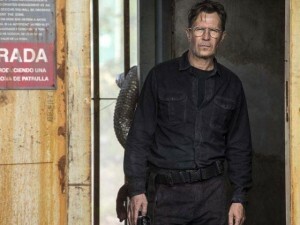 The humans in this film include Gary Oldman, Keri Russell and Jason Clarke. Oldman is always great and, though possibly spreading himself a little thin lately, the trailer suggests he’ll be at his best. The performance capture work of Andy Serkis as Caesar was incredible in the first film, and he looks terrifying in the trailer for Dawn. He was completely believable as an ape, but brought his human emotion into the performance too. Technology has only improved since then, so it’ll be exciting to see how Caesar acts in this film. Maybe Caesar will take Gollum’s place as Serkis’ greatest performance capture yet. As was the case with Captain America: The Winter Soldier recently, the sequel for this film has already been announced, with the same director, Matt Reeves, at the helm. This is a confident move from 20th Century Fox, showing the faith the studio has that they’ve made a great movie. We’ll probably get another trailer or two before it’s released, so let’s start getting really excited about what could prove to be the best blockbuster of the year. Dawn of the Planet of the Apes is released in the UK on 17 July 2014.